SAA’s community engagement initiative, ArKIDecture, will display works by its young alumni in the “My Urban Backyard” exhibition at The URA Centre from now to 27 April, 2018. As part of the Urban Redevelopment Authority’s (URA) Urban Planning Festival 2018, the exhibition features projects completed by children between the ages of 8 and 12 years at last year’s Archifest “ArKID Build: A City in a Garden” workshops. Designed and curated by SAA, the workshops sought to engage children creatively and imbue in them a sense of design through architecture. 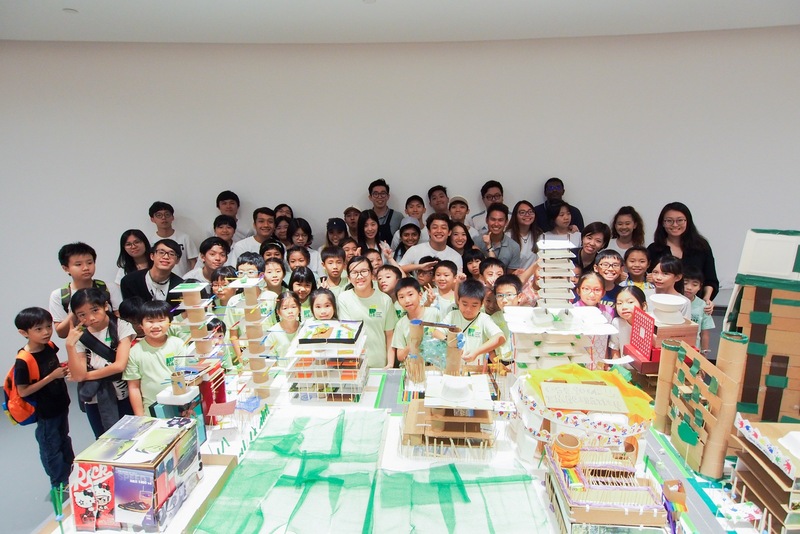 The young participants were allocated a symbolic plot of land, on which they designed and built dreamt-up model buildings made of recyclable material, which together formed ‘the city’. The official opening of the Urban Planning Festival will take place on 12 April 2018. ArKIDecture is an SAA initiative that aims to inspire interest in the natural and built environments in children and youths through hands-on experiential learning. Through this initiative, we are able to integrate what we do as a profession with giving back to the community. This not only allows us to impart learning, but to also learn from the process of teaching; holistically aiding in our professional, and personal, development as architects.